Platforms at commuter stations will have to be lifted to fit the train doors’ height – and then there’s the safety permit furore due to a broken signalling system. The official opening of the multibillion-rand locomotive manufacturing plant in Dunnottar on the East Rand was widely welcomed yesterday, but it’s going to be a while before the locomotives – which are costing R51 billion – can be put to work and they may be a white elephant for some time yet. That’s because the commuter line stations on which they will be used will have to undergo major renovations, including to their platforms, which are not the same height as the train doors. Another major problem is a safety permit furore between the Rail Safety Regulator (RSR) and the Passenger Rail Authority of South Africa (Prasa), thanks to the collapse of the signalling system. This culminated in a court order last week preventing any new stock being allowed to hit the tracks. On Wednesday, finance minister Tito Mboweni called for better project management. 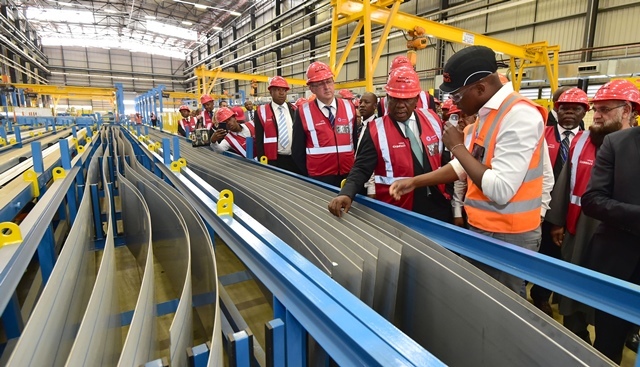 A joint exercise between Gibela shareholders Alstom (61%), Ubumbano Rail (30%) and New Africa Rail (39%), the plant is expected to deliver two new locomotives by December, nine by March 2019 and an estimated 56 locomotives over the next two years. The entire R51 billion contract was for 600 XTtrapolis Mega locomotives over 10 years for Prasa, of which 20 were already manufactured in Brazil, according to Alstom, and the other 580 will now be built in Dunnottar, creating up to 1 500 jobs. Gibela claims on its website that the trains – which are currently undergoing tests on a 23km-long line outside Pretoria – will have easy access for passengers with disabilities or those with prams. However, in January this year, Prasa’s strategic asset development group executive, Piet Sebola, told Engineering News the challenge facing Prasa was that the platforms at its stations were too low for the new rolling stock. He said the organisation had been aware of this “from the start of the new rolling stock programme”, Engineering News reported. He said also that the project to lift the platforms – expected to form a significant part of the ten-year R172bn project to modernise rail infrastructure around the country – had not been progressing as expected. In response, Prasa spokesperson Nana Zenani insisted yesterday it was a case of the new meeting the old and said its modernisation program, launched in 2014, was on track. The program included rebuilding where necessary, upgrading signalling and electronics, and of course the replacement of rolling stock and locomotives. It’s not the first time Alstom has been here either, with France reportedly paying fifty million euros in 2014 to shave its platforms because the new trains were too wide. And while Prasa literally moves earth to accommodate Gibela’s new trains, there are 12 locomotives which Prasa has bought and paid for which can be used on both long distance and metro lines. Despite concerns about the AFRO4000 locomotives’ height, they were given approval for use with modifications by the RSR, but currently sit gathering dust in a warehouse in Spain. In recent years, due to the lack of functioning locomotives, long distance rail has only operated intermittently and in recent months not at all. Festive season travellers will need to find other means of transport come December. However, it is moot at this stage as the Swifambo Rail contract has been set aside and in a nutshell, Prasa has paid billions for a product which works but it doesn’t want anymore. The court found Swifambo had fronted the entire deal. “They should not have been given the tender in the first place,” said Justice EJ Francis. Swifambu is applying for leave to appeal the matter next week. In the meantime, the 12 Swifambu locomotives (there were 13, one crashed) which were modified to fit following the size debacle, are currently undergoing testing outside Pretoria. The RSR spokesperson Madelaine Williams said these would only be allowed to enter the system once it was satisfied with the results of the tests being conducted. The plant is expected to deliver two new locomotives by December, nine by March 2019 and an estimated 56 locomotives over the next two years. 20 were already manufactured in Brazil. 580 will now be built in Dunnottar. The project creates 1 500 jobs.